The Blizzard PPC is a PowerPC-based accelerator for Amiga 1200. 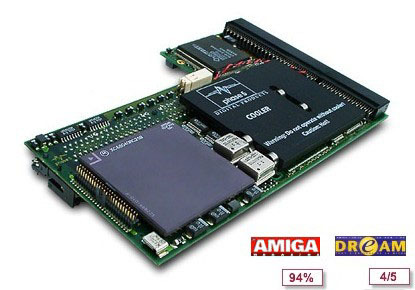 Primarily being designed as an upgrade board for existing Amiga systems, the Blizzard PPC incorporates an innovative dual-processor technology, where a fast PowerPC RISC processor is combined with a 68k processor, in case of the Blizzard PPC either a 68040 or a 68060 CPU, and a memory expansion option for up to 128 MByte of high-speed memory by use of standard SIMMs. Both CPUs dynamically share the memory and system busses, what is necessary for a true multiprocessor behavior. An on-board Fast-SCSI-II controller is integrated as well, allowing the connection of a variety of SCSI devices such as hard drives, streamers, removable media or scanners (only Blizzard 603e+). As an important additional feature a direct slot is also implemented, enabling the customer to use the powerful graphics board BVisionPPC Graphic Board or G-REX 1200.